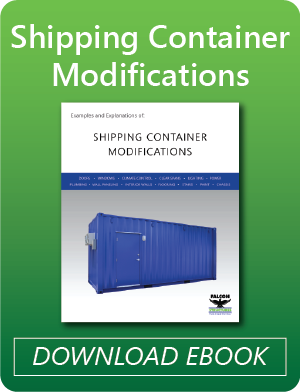 The use of a modified shipping container for your business’ operation has been decided. The steel structure has the ideal exterior dimensions. The inherent strength of the corrugated steel combined with its overall stability and mobility has made it the perfect base structure for the extra space you need. Now comes the interior layout and the placement of openings, personnel stations, electrical hook-up or bathroom facilities. Whatever the intended use of your conex box is, there are some Questions to consider to assist in the interior design of your 20 or 40 foot repurposed shipping container. What Are You Using the Your Shipping Container Space for? Be aware of the dimensions of the interior space. While the exterior dimensions are standard, the addition of insulation, finished ceilings or ductwork reduces the maximum interior height and width. Consider the square footage of the interior space after the addition of modifications when determining the amount of items that can be contained inside. In the case of the modified conex container office, ideally two individuals to one 20-foot container and 4 to a 40-foot container is ideal if the space is used for a full 40-hour workweek. Are you in a client-facing business and is the office furniture you plan on using sized to accommodate this? Interior space planning through modeling is recommended for the placement of workstations and interior equipment. How Often Will You Use Your Container Space? If the Utility or Office Box is used intermittently, consider the maintenance steps to insure ventilation is continuous and the interior space is cared for. Using interior cooling and heating occasionally without continuous humidity control can create moisture build up. How Much Heating and Cooling is Required? You have taken into consideration the use of the conex box and the amount of items or personnel that will be using it. It is important to consider the interior climate needs. If the interior space is broken up into rooms or workstations, it will be important to design airflow through duct work or wall placement to maintain uniform temperature. The Boxperts at Falcon Structures will work with you to determine the correct amount of air conditioning combined with the insulation type to use to create a climate-controlled environment. Different HVAC units have different space requirements and energy source needs. Depending on your needs this will be taken into consideration. What is the Climate Where the Conex Box Will Be Located? The exterior climate will be a factor when deciding on a few of the interior design elements of your repurposed shipping container. The exterior climate will help determine how much heating or cooling needs to be supplied to the interior structure. The elements of snow, wind and rain should be taken into consideration when considering floor insulation and interior ceiling finish outs. The use of a steel repurposed shipping container is ideal due to its exterior strength and water and wind resistant structure. The amount of snow, rain and ice will be factors in insulation, ceiling structure and opening protections. Where Should We Position the Shipping Container's Openings? The standard repurposed shipping container comes with cargo doors at one end. These doors swing open and hinge flat against the sidewalls. These doors may or may not be used and can be disabled. Additional openings such as personnel doors and roll up doors should be positioned to accommodate the cargo doors if they are enabled for use. Personnel door placement will need to be reviewed. Door handles and exterior facades can add inches to the overall dimensions and should be taken into consideration. These structures are moved via forklift operation and additional dimensions can affect those supports. There is a lot to consider when planning out the interior space for your conex box project. While we have touched on some key questions to consider at the onset of your next project, your business operation may have unique circumstances. You may not be aware of areas to consider in addition to the above questions when planning the interior space of your repurposed shipping container. The Boxperts here at Falcon Structures have a wealth of industry experience and have worked with a wide variety of businesses. Our staff is ready to assist you in your product selection and any additional interior design elements to create the ideal solution to simplify your business.